To keep production processes lean and stocks low, the automotive supplier, NIDEC GPM Group, relies on the autonomous mobile robots from Mobile Industrial Robots: at its location in the Thuringian municipality of Auengrund, three MiR100 robots, equipped with the MiRHook towing system, transport material and empty containers between the warehouse and assembly lines. The freed-up human resources can be converted into productive time. Such innovative capacity is a prerequisite for NIDEC to remain competitive. For about 70 years, the current NIDEC GPM Group has been developing innovative pump solutions for the automotive industry. The manufacturer, based in the Thuringian municipality of Auengrund, is considered a technology leader and continues to set new standards in the field of pump technology. Taken over three years ago by the Japanese NIDEC Group, the former family-owned company now wants to successfully establish itself on the market as e-mobility progresses in order to remain competitive in the long term. Above all, a strong focus on research and development is crucial for this. Of the 1,200 employees at the German location, one in ten is already employed in this area today. In order to use the existing capacities as efficiently as possible, NIDEC GPM has increasingly relied on the Lean principle since the acquisition to avoid wasting resources and to maximise performance. The company increasingly incorporates state-of-the-art robotics solutions on its production lines. In light of this, it seemed only logical to automate internal material flow as well. Those responsible went in search of a driverless transport system that could manage without structural changes to the infrastructure and could be implemented quickly. Finally, at a trade fair, they came across the autonomous, mobile transport robots from Mobile Industrial Robots (MiR). "The robots immediately won us over with their great flexibility," recalls Andreas Vogt, Deputy Production Manager and Lean Expert at NIDEC GPM. Equipped with sophisticated sensor technology and safety algorithms, the agile MiR robots manoeuvre independently and safely - also in the vicinity of their human colleagues. They recognise obstacles such as objects or employees from a distance and always move around them or make a safety stop. As a result, there is no need for magnetic strips or rails - exactly what the people responsible for the plant in Auengrund had been looking for. After a brief test phase, the decision to acquire robots from MiR was soon made. In close collaboration with the local system integrator, the company successively introduced three MiR100s with the MiRHook towing system in two different production areas. Thanks to their uncomplicated commissioning process, NIDEC GPM was able to quickly integrate them into the current processes. Before their first mission, the robots first travelled all over the factory floor and mapped out their future working environment. For this the robots rely on a powerful laser scanner. On this basis, the mobile robots can get their bearings later on and independently find the fastest way to the destination. Finally, the hook enables them to grip carts and shelf trolleys ideally and move up to 300 kilos per journey. They autonomously navigate between storage and assembly areas, transporting oil pump lids, water pump bearings and drive shafts to where they are needed. Franz Scheibe, Team Leader for Assembly, programs the mobile robots for their daily tasks. For this he uses the fleet management software MiRFleet, which is incorporated in all three robots. “A typical journey looks like this: when the robot is summoned by an employee, it starts from its waiting position in the 'supermarket', which is the area where all our parts are in stock. Then it hooks up to the appropriately loaded cart, which it recognises by a QR code, and sets off”. When driving, the robot beeps so that the employees hear it despite the machine noise and do not accidentally run it over. "With the material in the cargo area, the robot then moves to the assembly line where the respective parts are needed”, continues Scheibe. "It uncouples the full cart and takes an empty one back in return. It transports the empty cart back to the warehouse before returning to its waiting position in the ‘supermarket’”. On the way, the robots also independently cross a lock gate, which opens in contact with a magnetic loop in the ground. On average, each robot covers eleven kilometres a day - a distance that the employees now do not have to walk. Scheibe sums up as follows: “Imagine this: we have the robots operating around the clock, five days a week. This saves our employees a lot of walking and thus a lot of work time”. 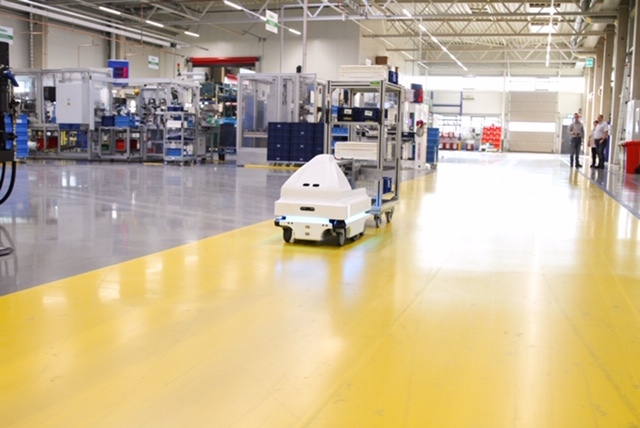 In one production area of the Thuringian plant, a mobile robot supplies the employees with material at an almost fully automated plant. Two robots are in use in another area, where they supply ten assembly lines there with components. This used to be done by a logistician, says Andreas Vogt. "In those days, there was usually too much material on the assembly lines - and that is of course an unnecessary cost”. Today, the robots supply the employees at the machines with exactly the amount of material they need at the right moment. For NIDEC GPM foreman Johannes Otto, the impact on everyday working life is clearly noticeable: “We have much less material in the production area than before. This saves a lot of space”. Fully in keeping with the Lean principle, NIDEC GPM can optimise its stock and keep storage costs low. Nevertheless, some employees initially had doubts about their new robot colleagues, says Johannes Otto. "At first, even I had a bit of a concern about it. But then I quickly realised: this is progress and helps us in our daily work. That’s a good thing”. The robots are only relieving employees of repetitive transportation tasks. Add to that the fact they’re easy to handle - and the misgivings quickly disappeared. “The robots are really super intuitive to use”, says Franz Scheibe. "My colleagues quickly learned to generate new orders and get supplies”. They use a web-based interface that can be accessed via a tablet, mobile or computer. With MiR technology, NIDEC GPM has found a cost-effective way to automate its internal material flow. The acquisition of two more robots is already in the planning stage. Currently, the MiR100 frees up the resources of one full-time employee. Amongst other things, this eases the burden and contributes to a greater focus on productive work time. In addition, resources are pooled in the area of research and development. This is an important aspect, as NIDEC GPM soon wants to offer its customers technological solutions and advantages with regard to electrically driven pumps “The area of R&D is the basis on which we can develop our sustainable and innovative technologies”, explains Andreas Vogt. "By automating intralogistics with mobile robots, we are also keeping pace with innovative solutions in production”. With this approach, the company is laying the foundation for remaining competitive in the automotive market of the future. NIDEC GPM has been developing pump technologies for the automotive industry for around 70 years. With its headquarters in the Thuringian municipality of Auengrund, the company employs 1,200 people and is a world leader in the mechanical, switchable and controllable pump systems market. The innovative products make a valuable contribution to reducing CO2 and saving fuel. Since 2015, the company has been part of the NIDEC Group, the world market leader in the field of small engines, and intends in the future to expand its product range to include electrically driven pump solutions.